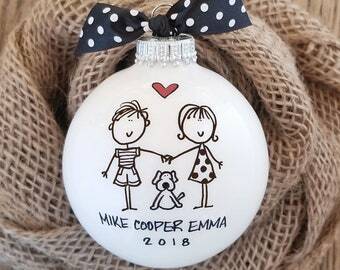 Each ornament is individually drawn/painted by hand. 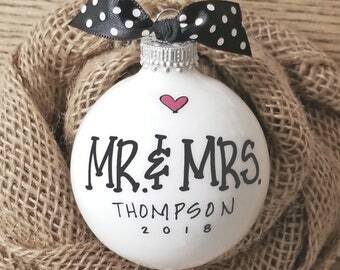 - Last name is included on Mr. and Mrs. ornaments. 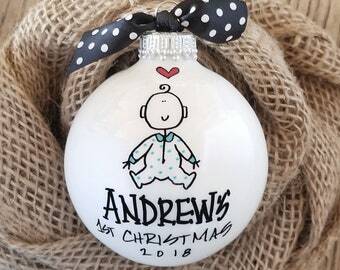 - each ornament is finished with hand-tied polka dot bow. 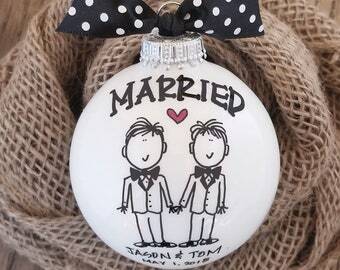 - packaged in a tasteful white gift box with black stretch loop bow. - securely packed and thoroughly padded for safe shipping. 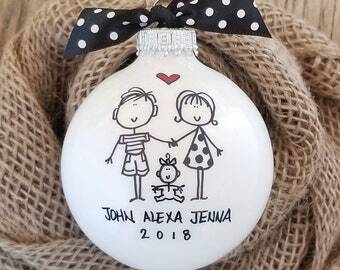 Artwork may vary slightly from photo as each design is drawn/painted by hand. 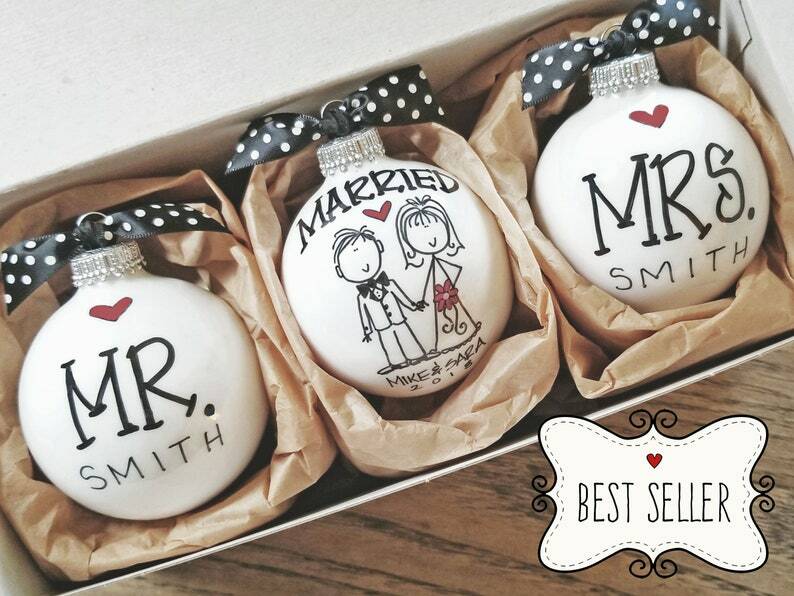 Wedding Gift, Gift for the Couple, Wedding Ornaments, Personalized Couples Gift, Mr. & Mrs. Keepsake, Unique Wedding Gift, "Mr/Mrs-Happily"
Wedding Gift, Wedding Ornaments, Wedding Gift Set, Personalized Wedding Ornament, Bride and Groom Keepsake, Couples Gift -"Grow Old With Me"
Wedding Ornament, Keepsake Wedding Gift, Personalized Wedding Gift, Bride Groom Ornament, Wedding Gift, Unique Wedding Gift, "I Do. Me Too." 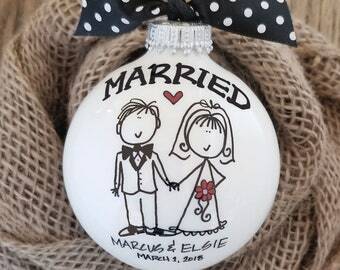 Wedding Gift, Gift for Couple, Personalized Wedding Ornament, Bride Groom Ornament, Personalized Wedding, Bridal Shower Gift, "All My Love"
It is evident that great care & details were put into this gift. Arrived fast, much faster than most orders coming from Etsy. 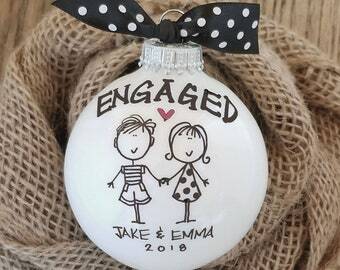 The best gift for a married couple! 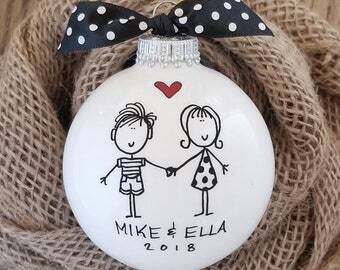 Everyone I’ve given it to has loved it!! 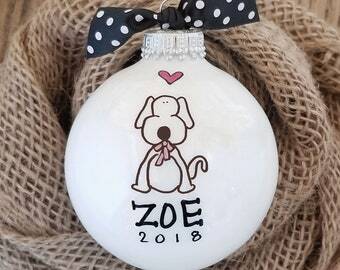 How do I get my personalization information to you for ornament orders? 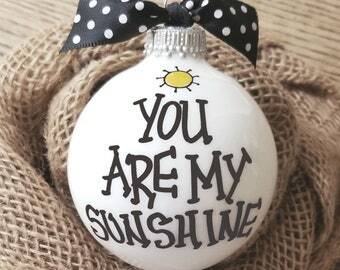 Personalization information should be included in the "Notes to Seller" box during the ordering process. All items are presented in a white box with a black stretch loop bow. 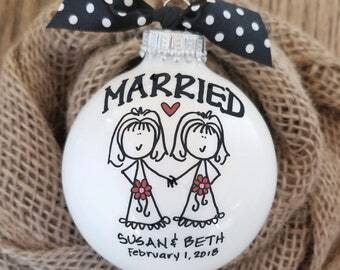 I'm sending directly to my gift recipient - can you include a note? Absolutely! Just include that info in the "Notes to Seller" box when placing your order.